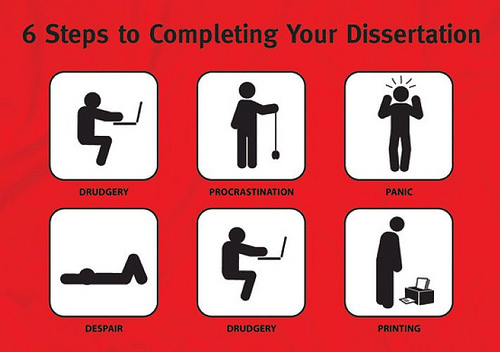 The words ‘final year’ are inevitably associated with the dreaded D word, the you-know-what, the… dissertation. I wonder, if I just go a long while without saying it and pretending it doesn’t exist, will it go away? Will someone take pity on me as I sit in a heap of German articles and books looking bewildered and just write the whole thing for me? Sadly, wishful thinking doesn’t take you very far at all. The irony is, as a joint honours student, I didn’t even have to do a dissertation. Yes, I know. What right do I have to complain when I had the possibility of a you-know-whatless degree? When choosing final year modules, a choice between 20 credits done in a nice pre exam period bundle and an extra few sessions in the Sports Hall chewing your pen and getting hand cramp seems like a simple one to make. Except that nice little bundle is 8,000 words long. Next term, I’ll be laughing, but this term, I’m skipping meals to get that extra 100 words in before work or Jitsu, staying up later than I should be and trying desperately to finish off reading that book that should have been read weeks ago. It’s just not healthy! Although it’s not so much the word count that bothers me. I’ve probably written my dissertation’s worth and more in various articles I’ve written for The Siren, The Waterfront and Alternative Magazine Online over the course of this term alone. It’s more the worry that none of it will make sense, and that whoever reads and marks it will think that I’m talking utter rubbish. Now, I have a whole host of other deadlines to meet before the dissertation is in, from my application to Cardiff on the 28th to my 2,500 word essay due in on March 7th. I still utterly fail to understand how I haven’t spontaneously combusted from the amount I try to get done in a week, as I clearly seem to enjoy making life harder for myself! On the plus side, it’s not like I’ve chosen a boring topic. It’s based around things which have happened literally towards the end of last year, so the majority of my research has involved trawling through the archives of various German newspapers. I’m lucky, because my topic is one which genuinely interests me, but that makes the pressure to get it exactly right even more urgent. One of my coursemates told me today that she’d finished her dissertation, and with that, panic writing mode was set to full throttle… back to the pile of books it is.